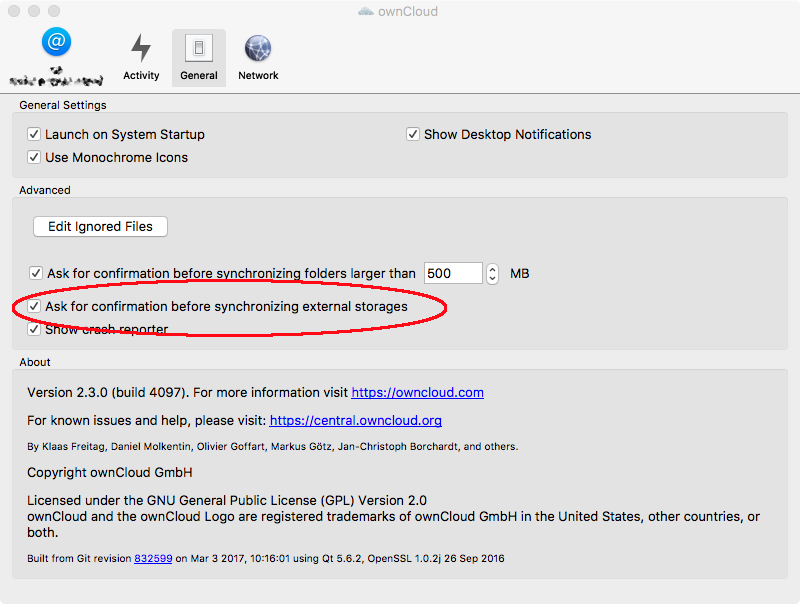 Grab the brand new ownCloud Desktop Client 2.3.0 for either Mac, Windows or Linux (or build it from source)! It features many improvements under the hood as decreased memory (up to 300% !) and CPU usage as well as better time/bandwidth estimation during sync. 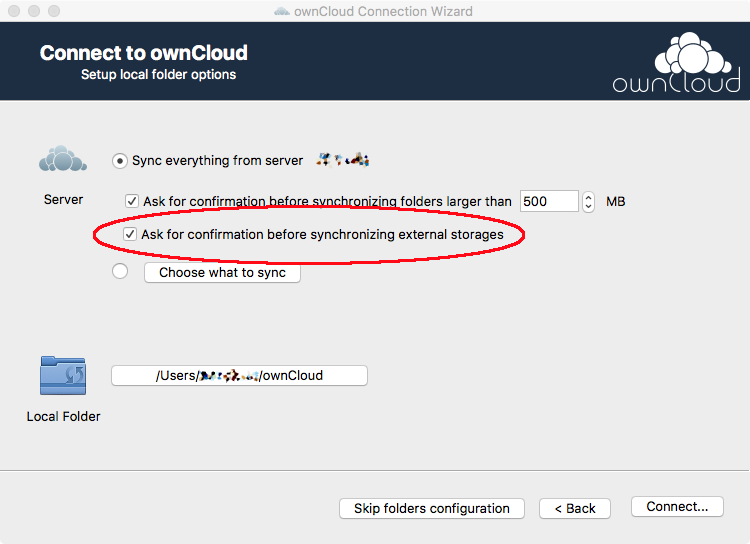 In the frontend you might notice two big improvements concerning the sync of external storages (integrated storages like Dropbox, Google Drive, Samba etc.) 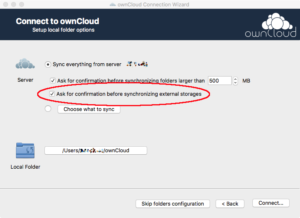 : You can now easily deny or allow the sync of external storages – both on initial setup as well as later on in the settings. Just like you already could handle large folders to sync or not to sync. 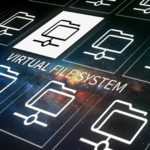 External storages are furthermore shown with a separate icon in the folder list to easily spot the folders located on secondary storages. Another really big improvement can be found when right-clicking on a file to share. Public share links can now be transferred to your standard mail client directly after creation (Button ‘Mail link’) which delivers a massive increase of productivity. 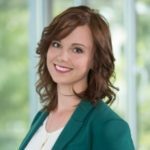 To keep your password only for personal access, the new client version also allows to work with app-specific credentials that users can generate in the web interface. 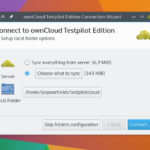 ownCloud Desktop Client 2.3.0 additionally introduces Qt 5.6.2 on Windows and Mac (Linux upcoming as well!) as well as improved error messages for users. Another great security feature the release includes is support for SSL client certificates that provide an additional layer of security by empowering admins to distribute certificates to users and restrict access thereby (in addition to usual passwords). 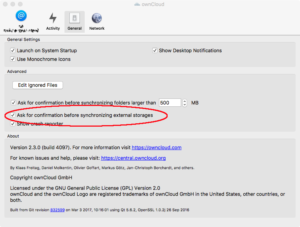 The full changelog can be found at https://owncloud.org/changelog/desktop/. Make sure to update today to get these awesome new features! Great to desktop client is moving on! A quick feedback about the e-mail link… To my mind the button “Mail link” is a bit confusing – does it mean getting a link for e-mail or does it send link by e-mail? I guess user can find out by trying it out, but could be more intuitively understood still. @Silver The ‘Mail link’ feature passes a created public link into a new mail window of your standard mail client for that you can send it wherever you want by just entering a mail address. Thanks for the release! Glad to see that OC is still alive and actively maintained after the fork. I am using Mac Pro Operating system. It protects your system you do not face any issues related to the virus problem and any the rates of malware problems. It provides one of the best protection on your computer.